Constipation is a very common problem in human life which affects people at some point of their life. If left untreated it can lead to serious digestive problems. The biggest problem of constipation is the stools become so hard that it becomes difficult for the person to excrete with ease. However, Yoga asanas can help overcome this problem. Following are some of the Asanas which when practiced on a regular basis can help fight constipation. 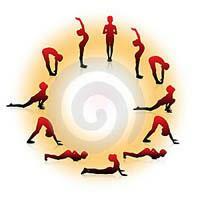 Surya Namaskara (Sun Salutation): The Surya Namaskara or the sun salutation is nothing but a prayer in motion. This Yogic Asana is made up of twelve postures in all which need to be performed on a continuous basis and that too with synchronized breathing. There are numerous benefits of performing the Surya Namaskara. It activates all the endocrinal glands which in turn ensure the normal secretion of hormones by the pancreas, thyroid, adrenal, pituitary, thyroid and other glands. Surya Namaskara heals the disorders related to liver, pancreas, indigestion, intestinal problems, and acidity thereby curing constipation. Hala Asana: The meaning of the word Hala Asana means a plough. In this asana you stretch your body in such a way that it resembles a plough. This Asana helps to build muscles, regulates the flow of blood in the body and also regulates constipation occurring as a result of weak abdominal muscles. Dhanurasana (the bow pose): This Asana involves holding the toes with hands and curving the body in such a way that it resembles a bow. This yogic Asana strengthens the spine and makes it flexible and is efficient in treating ‘pitta’ disorders such as constipation. This Asana, when practiced on a regular basis, can also improve digestion and provide massage to the entire back. Pavanamukta Asana: In the Sanskrit language, the word ‘pavana’ means the wind or air and the word ‘mukta’ means release or freedom and hence this Asana is known as the ‘wind relieving posture. This Asana is so named because it helps to release all the trapped gas in the stomach and intestines. It stimulates the abdominal region thereby treating constipation and other gastrointestinal problems such a stomach upset. Ardha Matsyendrasana: This Yogic asana massages the vital organs such as stomach, kidneys, pancreas, liver, gallbladder and small intestines. When practiced regularly, this Asana can help to treat various problems such as constipation, diabetes, hay fever, sinusitis, menstrual disorders, bronchitis and urinary tract disorders. These were some of the Yogic Asanas, which help you to get rid of constipation. However, with these asanas, you also need to make some healthy changes to your diet. Concentrate more on eating foods such as fresh fruits and leafy vegetables which have rich fiber content. Also, don’t forget to drink eight glasses of water per day.